Martina Navratilova, long heralded as one of the greatest tennis champions of all time, appeared as a commentator for the BBC’s Wimbledon programming last year. 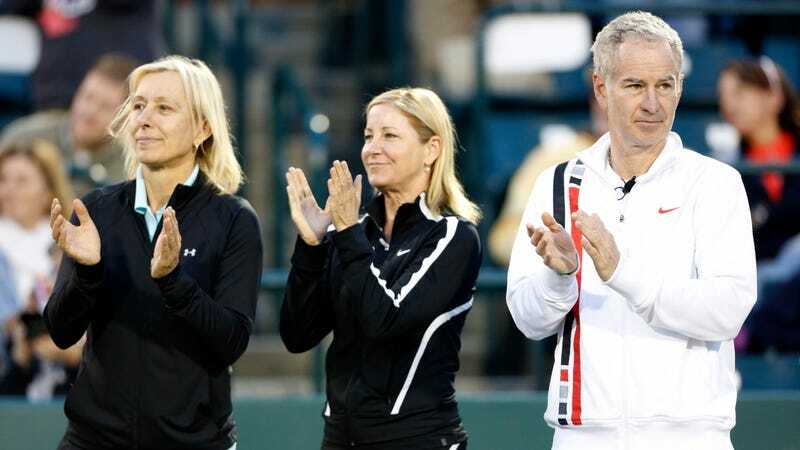 But according to Navratilova, she made at least 10 times less for those appearances than male counterpart John McEnroe, a slight she says is in line with the BBC’s widely reported gender pay gap. In an interview with BBC Panaroma, as part of the station’s upcoming special, Britain’s Equal Pay Scandal, Navratilova alleged that when the BBC was forced to disclose the salaries of its top broadcasters in July 2017, she discovered McEnroe was making somewhere in the £150,000 to £199,999 bracket, while she netted only £15,000 for a comparable job. “[U]nless John McEnroe’s doing a whole bunch of stuff outside of Wimbledon he’s getting at least 10 times as much money,” Navratilova said. But Navratilova says she was told she and McEnroe did comparable work, and considering the recent BBC salary reveal exposed a significant gender pay parity—one so vast it prompted senior BBC editor Carrie Grace to quit, instigating an internal review process into the organization’s wage structure—it’s not particularly outlandish to think Navratilova’s getting screwed. Britain’s Equal Pay Scandal airs on BBC One on March 19.